For the hereditary society, see Order of the First Families of Virginia. First Families of Virginia (FFV) were those families in Colonial Virginia who were socially prominent and wealthy, but not necessarily the earliest settlers. They descended from English colonists who primarily settled at Jamestown, Williamsburg, The Northern Neck and along the James River and other navigable waters in Virginia during the 17th century. These elite families generally married within their social class for many generations and, as a result, most surnames of First Families date to the colonial period. The American Revolution cut ties with Britain but not with its social traditions. While some First Family members were loyal to Britain, others were Whigs who not only supported, but led the Revolution. Most First Families remained in Virginia, where they flourished as tobacco planters, and from the sale of slaves to the cotton style. Indeed, many younger sons were relocated into the cotton belt to start their own plantations. The Civil War devastated the Virginia economy, and emancipated all the slaves without compensation. Planters and small farmers both were economically hurt, but in general the First Families, albeit poorer than before, maintained social and political leadership. Marshall Fishwick says that by the 1950s, "the old-time aristocracy [had] not given up, or sunk into decadence as Southern novelists suggest." They adopted modern agricultural technology and co-opted rich "Yankees" into their upper-class, rural horse-estate society. English colonists who formed the FFV emigrated to the new Colony of Virginia. Their migration took place from the settlement of Jamestown through the English Civil War and English Interregnum period (1642–1660). Some royalists left England on the accession to power of Oliver Cromwell and his Parliament. Because most of Virginia's leading families recognized Charles II as King following the execution of Charles I in 1649, Charles II reputedly called Virginia his "Old Dominion" – a nickname that endures today. 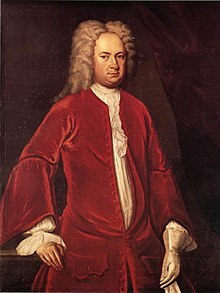 The affinity of many early supposedly aristocratic Virginia settlers for the Crown led to the term "distressed Cavaliers", often applied to the Virginia oligarchy. Some Cavaliers who served under King Charles I fled to Virginia. FFVs often refer to Virginia as "Cavalier Country". These men were offered rewards of land, etc., by King Charles II, but most who had settled in Virginia stayed in Virginia. Many such early settlers in Virginia were so-called "Second Sons". Primogeniture favored the first sons' inheriting lands and titles in England. Second or third sons went out to the colonies to make their fortune, or entered the military and the clergy. Tidewater Virginia evolved as a society descended from second or third sons of English gentry who inherited land grants or land in Virginia. They formed part of what became the southern elite in America. In some cases, longstanding ties among families of the English gentry were carried to the new colony, where they were reinforced by marriage and other relations. For instance, there were ancestral ties between the Spencer family of Bedfordshire and the Washington family; a Spencer secured the land grant later purchased by the Washingtons, where they built their Mount Vernon home. These sorts of ties were common in the early colony, as families shuttled back and forth between England and Virginia, maintaining their connections with the mother country and with each other. A thin network of increasingly interrelated families made up the planter elite and held power in colonial Virginia. "As early as 1660 every seat on the ruling Council of Virginia was held by members of five interrelated families," writes British historian John Keegan, "and as late as 1775 every council member was descended from one of the 1660 councillors." Many of the First Families of Virginia can trace their ancestry to Pocahontas (1595–1617), a Native American. She was the youngest daughter of Nonoma Winanuske Matatiske and Chief Powhatan, founder of the Powhatan Confederacy. According to Mattaponi and Patawomeck tradition, Pocahontas was previously married to a Patawomeck weroance, Kocoum, who was murdered by Englishmen when Samuel Argall abducted her on April 13, 1613. Educated among the English of Virginia and converted to Christianity during her captivity in Henricus, Pocahontas married colonist John Rolfe at a church in Jamestown on April 5, 1614. Rolfe had become prominent and wealthy as the first to successfully develop an export cash crop for the Colony with new varieties of tobacco. Their only child, Thomas Rolfe, was born on January 30, 1615. He married and had a family: his descendants married into other elite families. 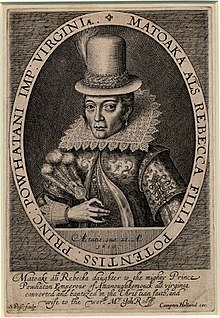 Pocahontas was much celebrated in London where she was welcomed with great ceremony at the Royal Court. She died young but became legendary as the first Indian from Virginia to become Christian, marry an Englishman, and have a known child from such a marriage. (There were no doubt mixed-race children born to lower-class colonists and Algonquian women, although they may have been neither married nor Christian.) She became an important symbol of friendly Native American-English relations of the Jamestown colony. By virtue of many fictional accounts, her marriage was romanticized and became part of the mythology of early American history. In 1887, following the Reconstruction era after the Civil War, Virginia Governor Wyndham Robertson wrote the first history of Pocahontas and her descendants, delineating the ancestry of FFV families including the Bollings, Clements, Whittles, Blands, Skipwiths, Flemings, Catletts, Gays, Jordans, Randolphs, Tazewells, and many others. Excluded from this history were 'natural children', mixed-race descendants of unions with slaves. Families often used surnames as given names, as in the "Johns" of Johns Hopkins University. A mother's maiden name might be used as a "middle name", to document that part of the person's ancestry. For example, Lt. Col. Powhatan Bolling Whittle of the 38th Virginia Infantry, Confederate States Army was an uncle of Matoaka Whittle Sims. In 1907, the Jamestown Exposition was held near Norfolk to celebrate the tricentennial of the arrival of the first English colonists and the founding of Jamestown. Preservation Virginia, formerly known as the Association for the Preservation of Virginia Antiquities, was founded in Williamsburg in 1889 to memorialize Virginia history. In the 20th century, Preservation Virginia emphasized patriotism by highlighting the Founding Fathers that hailed from Virginia. Lila Hardaway Meade Valentine (1865–1921) was from a First Family that lost most of its money in the Civil War Era. She was self-educated and became a leader in educational reform in Richmond. She organized the Richmond Education Association and founded a training school for kindergarten teachers. She promoted vocational education and helped organize the Instructive Visiting Nurses' Association. She promoted programs regardless of race. After 1900 she was a leader in the state's women's suffrage movement. ^ a b c d e f g h i j k l m n o p q r s t u v w x y z Tyler, Lyon Gardiner, ed. (April 1915). "The F. F. V.'s of Virginia". William and Mary College Quarterly Historical Magazine. Richmond, Virginia: Whittet & Shepperson. 23 (4): 277. Retrieved February 11, 2011. ^ Gutzman, Kevin R. C. (2007). Virginia's American Revolution: From Dominion to Republic, 1776–1840. Lanham: Lexington Books. ISBN 978-0-7391-2131-3. ^ Fishwick, Marshall (1959). "F. F. V.'s". American Quarterly. 11 (2): 147–156. JSTOR 2710671. ^ Keegan, John (2009). The American Civil War. New York: Alfred A. Knopf. p. 334. ISBN 978-0-307-26343-8. ^ Deyo, William "Night Owl" (September 5, 2009). "Our Patawomeck Ancestors" (PDF). Patawomeck Tides. 12 (1): 2–7. Archived from the original (PDF) on July 14, 2014. Retrieved July 6, 2014. ^ Blight, David (2002). Race and Reunion: The Civil War in American Memory (Paperback ed.). Belknap Press. ISBN 0-674-00332-2. ^ Lindgren, James M. (1991). "'Virginia Needs Living Heroes': Historic Preservation in the Progressive Era". Public Historian. 13 (1): 9–24. JSTOR 3378156. ^ Taylor, Lloyd C. (1962). "Lila Meade Valentine: The FFV as Reformer". Virginia Magazine of History and Biography. 70 (4): 471–487. JSTOR 4246896. ^ Fischer, David Hackett (1991) . "The South of England to Virginia: Distressed Cavaliers and Indentured Servants, 1642–75". Albion's Seed: Four British Folkways in America. Oxford: Oxford University Press. pp. 219–220. ISBN 9780195069051. Another unlikely 'FFV' was the wayward Pilgram Isaac Allerton, a London tailor's son who emigrated in the Mayflower to Plymouth Colony and resettled in Virginia, ca. 1655, where he married into Berkeley's ruling elite. ^ a b c d e f g h i j k l m n o p q r s t u v w x y z aa ab ac ad ae af ag ah ai "Questions and Answers". Notes and Queries. Manchester, New Hampshire: S. C. & L. M Gould. VI (2): 244–245. February 1989. ^ a b c d e f g h i j k Purvis, Thomas L. (1997) . "First families of Virginia". A Dictionary of American History. Malden, Massachusetts: Blackwell Publishers. p. 136. ISBN 9781577180999. Among the most prominent of these lineages are those of the Bland, Braxton, Byrd, Carter, Corbin, Fitzhugh, Harrison, Lee, Ludwell, Nelson, Randolph, Washington, and Wormley families. ^ Bruce, Philip A., ed. (1894). "Mutiny in Virginia, 1635". Virginia Magazine of History and Biography. 1 (4). p. 419, 2nd footnote. ^ Payne, Brooke (1937). The Payne's of Virginia. Richmond, Va: W. Byrd Press. ISBN 9780598483539. Retrieved June 26, 2018. ^ Scadding, Henry (1987) . "Biographies". In Armstrong, Frederick H. (ed.). Toronto of Old. Toronto, Canada: J. Kirk Howard/Dundern Press Limited. p. 376. ISBN 9781550020274. The Robinsons were one of the first families of Virginia where they settled about 1670, before becoming one of the first families of Upper Canada. ^ Boddie, John Bennett (1974). Colonial Surry. Genealogical Publishing Com. ISBN 9780806300269. Fischer, David Hackett (1989). Albion's Seed. Oxford University Press. ISBN 0-19-503794-4. Fishwick, Marshall (1959). "F. F. V.'s". American Quarterly. 11 (2): 147–156. JSTOR 2710671. Gutzman, Kevin R. C. (2007). Virginia's American Revolution: From Dominion to Republic, 1776–1840. Lanham: Lexington Books. ISBN 978-0-7391-2131-3. Note: Source 3 / Author: Marie Moore / Publication: RootsWeb.com, Nov 29, 2004 / "Note: died at sea"